What if wearing a perfume became a game? Or better still: a provocation against the most traditional codes? Assert your difference: create your own fragrance using three rare essences inspired by an extraordinary story…and feel seven times more unique! Bigarade ~ "for a fresh day...An association of citrus fruits, white tea and citrus flowers, on a soft wooden and musk base." Osmanthus ~ "for a fruity unctuousness...A fragrance that stands out for its Apricot and Peach notes, progressively revealing its floral middle notes and patchouli base." Olibanum ~ "for rapturous evenings...A hymn to Frankincense scents, highlighted by fresh and spicy top notes that gradually reveal deep Myrrh and Patchouli scents." Spearmint ~ "for an awakening of the senses...features a refreshing middle note imbued with spearmint. Citrus and floral notes contrast with a delightfully intense woodsy base note." Immortelle ~ "for a tender harmony...The soft scent of the lemon blossom is enveloped in a floral bouquet. Elevated by the intensity of amber and musk, this delicate top note is an invitation to take flight." Myrte ~ "to feel desired...Precious and beguiling, this fragrance is refined by sharp notes of myrte. A woodsy and floral top note and a musky, vanilla-tinged bottom note combine for a sensual, utterly feminine scent." I have no idea what to make of this. And “Hollywood Stromboli” sounds like a restaurant, not a perfume. Am I the only one confused by all of this?? The food “stromboli” was invented in the US — it’s also the name of an island, and perhaps the food meaning is not known elsewhere. Stromboli is also the name of the volcano on the island of Stromboli, which is off the nE coast of Sicily. It was also the name of an Ingrid Bergman movie (long before my time), which I suppose took place on the island. And what’s more, it was the setting of the scandalous (at the time) affair between Roberto Rossellini (yes, the father of that Rossellini) and Ingrid Bergman, so the movie (which is quite good) is infamous because of that. Not to mention the kidnapping puppeteer in Disney’s Pinocchio (but not in the original story). I guess I’m the only one who wasn’t cultured enough to know that. Still don’t want any of the frags. Amazingly enough ~and speaking of myself only~ I have seen the Rosellini film (back as a teenager) and didn’t know the American food!! All I knew was the Pinocchio reference…I think you did better! LOL! unfortunately all I can think of is onara, which means ‘fart’ in japanese. I find the story lines charming, the packaging attractive and the fragrance descriptions reasonable enticing. I can’t believe there are new fragrance company upstarts. I don’t understand economics at all. It is a cute idea. I don’t understand all the new niche lines either…and can only guess that huge numbers of them fail. haha seriously! stromboli sounds like an italian restaurant! See above…I think the idea of stromboli as food is only in the US. You are right about that…Stromboli is an American-Italian food. I’ve been to Italy many times and have never seen it there. It’s just unfortunate that all of us Yanks are going to automatically think of the food and sort of snort when we read the name “Hollywood Stromboli 1950”, which to my American ears sounds like a neighborhood Italian restaurant, or a line of frozen foods. Not the effect these folks were aiming for, I’ll wager. But perhaps they don’t particularly care. So far as I know, it is not distributed here as yet…so yes, guessing they won’t much care. i do like the idea and packaging though..
At the risk of sounding curmudgeonly, I DON’T find the idea interesting at all. I’ll make up my own darn story, TYVM! I should never read ad copy… it just ticks me off. And the scents might be nice, after all, although none of the lists of notes is really grabbing me. It’s interesting to me how often I read industry peeps saying that to be successful, fragrances need stories that connect with consumers (they don’t mean it quite so literally as this line, of course). I feel like that approach is no longer relevant to most consumers. your curmudgeonosity is forgiven just for being bold enough to use a word like curmudgeonly. Just investigating mind you, but the website doesn’t appear to accept Mastercard or Paypal etc…..only some method that I’m unfamiliar with but failed to write down so I could share with you all….however I did email them and inquire about the possibility of Paypal in the future…maybe it’ll give them an idea. “Paiement par CB avec le Crédit Agricole” and that is it. bummer. The good news is the shipping was phenomenally cheap. The nearest I can figure out is that it’s some kind of debit card issued by Crédit Agricole. Oh, do let us know what you find out! Bigarade sure sounds lovely but I haven’t met an osmanthus I like. But I guess Olibanum could go either way. I like this idea but it seems like a lot could go incorrectly. I’d much rather just have one perfume, you know. I guess I just don’t see the appeal. I’m not a huge fan of layering sets myself, although all three of the first set sound good to me. Weirdly enough, I’ve actually been to both Nara and Stromboli! 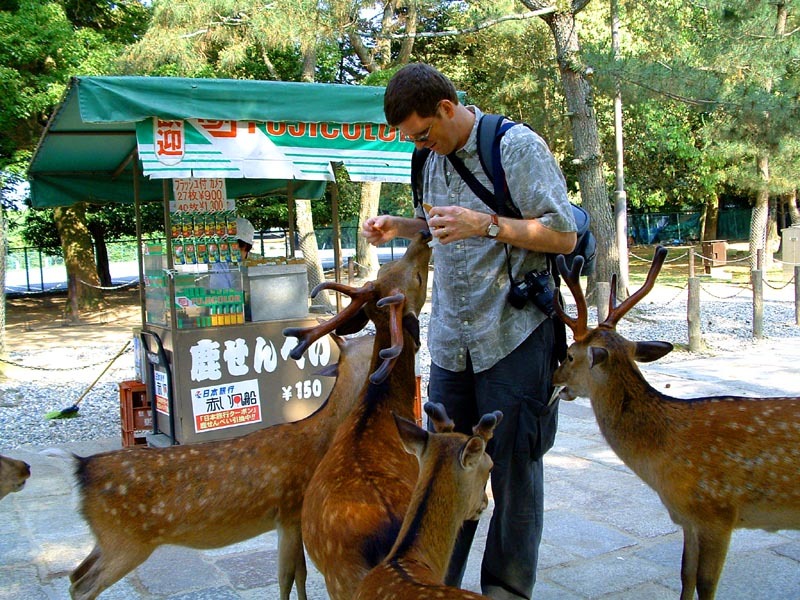 Nara is home to a humongous wooden temple and zillions of MUCH too tame deer that harass you for snacks, while Stromboli is the site of the aforementioned active volcano and the Rossellini/Bergman affair. Stromboli was wild and unspoiled when I was there as a kid, but it’s probably full of Eurotrash by now (I have a vague memory that Messrs. Dolce & Gabbana have a place there, which would confirm that suspicion). I like deer too, but these ones are mangy and really pushy — not cute at all! A deer’s cuteness level is directly proportionate to it’s distance from my landscaping…..they’re really just adorable from a couple miles away! How are these deer not FAAAAATTT? That’s funny. But have to been to Hollywood? Because if you have, I’d say you have to buy the whole caboodle. Oh no, I have! Maybe they’ll give me a special discount? I actually own the first set. I bought it on a whim at the Champs-Elysees Marionnaud last month, but I haven’t opened it yet. What can I say – it was a great price and I was intrigued. Now I need to actually try them. Hey, let us know how they are!